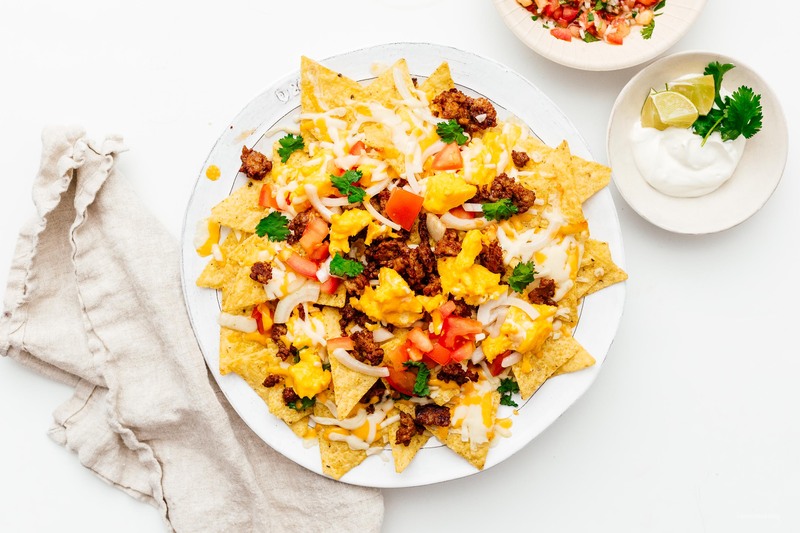 Yup, you can eat nachos for breakfast, especially when they're topped with soft scrambled eggs, spicy chorizo, and ALL THE CHEESE you can handle. I can eat nachos all the time, anytime, but there’s something especially satisfying about eating them for breakfast. These guys are topped off with crispy spicy pork chorizo, soft scrambled eggs, tomatoes, onions, and as much cheese as you can handle. The key to excellent nachos is layering instead of having a giant mountain of chips topped off with cheese. 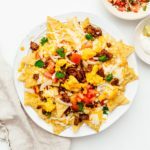 To achieve the perfect nacho layers, lay down a thin bed of tortilla chips, sprinkle on toppings, then do another thin layer of chips and toppings. Think of it like making a lasagna, that way you’ll never suffer a naked chip again. Note: I used a blend of cheese: Monterey jack, cheddar, and mozzarella. Feel free to use whatever mix you like. 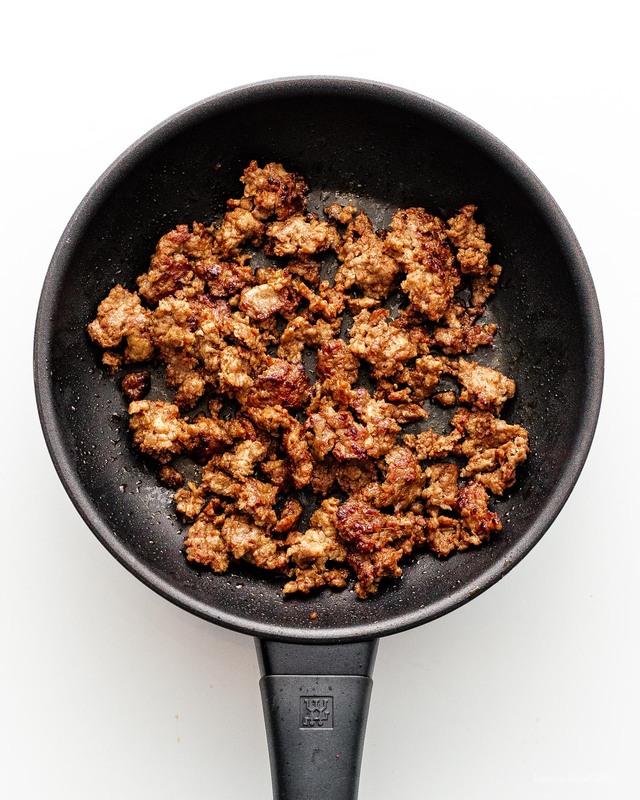 In a nonstick frying pan, fry the chorizo, breaking up, until cooked through and slightly crispy. Remove from the pan and set aside. Whisk the eggs in a bowl until incorporated and season with salt and pepper. Add the eggs to a cold pan, along with the butter. Using a rubber spatula, stir the eggs occasionally over medium-high heat so the eggs cook slowly and evenly, pushing only every so often so you end up with large curds, about 2-3 minutes. Undercooked is better as they’ll continue to solidify off the heat and cook in the oven. 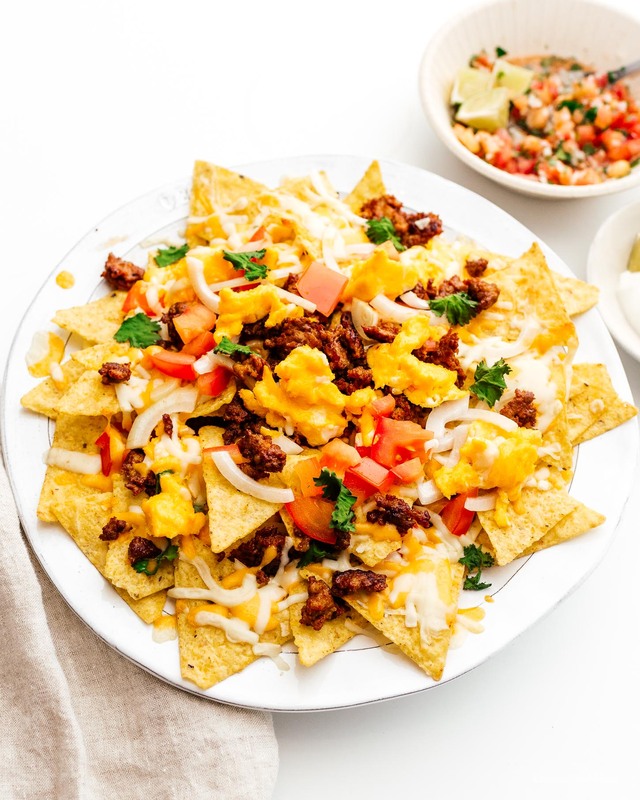 On an ovenproof plate, layer the nachos: chips, cheese, chorizo, bits of scrambled egg, tomato, and onion. Continue to layer until all of the ingredients are used up. Bake in the oven until the cheese melts, about 5-10 minutes. Remove from the oven and top with cilantro and serve with salsa and sour cream. That looks yummy. It kind of reminds me of the Mexican breakfast dish, Chilaquiles.